I know I've said it before, but this is such an exciting year for Pixar fans! Yes, the excitement always builds as we approach a new theatrical release. But this year we have not one but two releases, and both are looking to be amazing. Plus, not only are we looking to the future with these new films, but we can look back to the studio's first feature length film, as this year marks the 20th anniversary of Toy Story. Here are a couple news stories surrounding Toy Story. The first is a story that KTLA aired, going into how dependent Pixar was on the success of their first film. 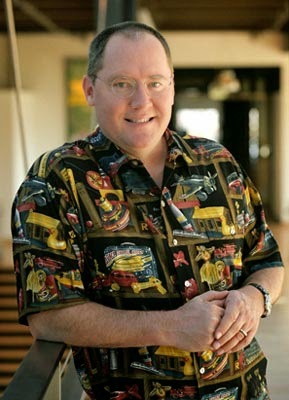 I love hearing from some of the long-time employees like Bill Reeves and Tom Porter, and hopefully with more attention being paid to Toy Story we'll be seeing and hearing from more of these artists who really created the computer animation industry. Twitter user e_pixar retweeted a Variety article which recapped a recent speech John Lasseter gave at the Academy of Motion Picture Arts and Sciences. He began by talking about technology and the part technology plays in film grammar. Then he went on to talk about the importance of learning the fundamentals and continuous learning, the importance of showing your work often, and surrounding yourself with people you trust, who will give you honest and candid feedback. I love these themes of learning and trusted mentors, and how they permeate the Pixar culture. I mentioned this in a post earlier this year where I highlighted some of my favorite Pixar interviews from 2014, and how often these topics came up in those interviews. I strongly recommend listening to the speech; if you want to hear it, head over to the Pixar Post and grab episode 38 of their podcast where they have a recording of it. As I started writing this article, I noticed I had started another article a few weeks ago that I never finished. That post contained links regarding Brent Schlender and Rick Tetzeli's new book Becoming Steve Jobs: The Evolution of a Reckless Upstart Into a Visionary Leader. 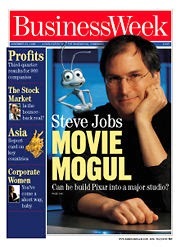 The first link was to a great BusinessWeek cover story written back on November 23, 1998, just days before A Bug's Life was released. Titled Steve Jobs, Movie Mogul, the in-depth article covered the beginnings of Pixar back at the New York Institute of Technology, through Job's purchase of the company from Lucasfilm, their film agreements with Disney and even hinted at a future where Disney might buy out Pixar. One quote I enjoyed was from Ed Catmull, who stated "We're not jumping on the bandwagon, we're making it." In addition to the cover story, the BusinessWeek site has links to other related information such as how the company brings a character like Flik to life and some estimates of how much profit Pixar could make from A Bug's Life. I will have to dig deeper into that last one and see how it compares to reality. Another article related to Becoming Steve Jobs came from Business Insider and talks about how Jobs split his time between Pixar and Apple, and how he was more hands off, and therefore more relaxed, when he was at Pixar. The article states that Apple employees would try to meet with Jobs on Fridays when he was at Pixar as he was less likely to get upset. A fun factoid, I found these last 2 articles through tweets from long-time Pixar employee AJ Riebli. If you read the BusinessWeek story, you'll recognize that it was Riebli who won the 1998 Halloween contest mentioned in the first paragraph of the article!